Featuring seven Lexicon reverbs, the new DigiTech Polara is a new, stereo reverb pedal that packs plenty of creative potential into a small footprint. Alongside more traditional Room, Hall, Plate and Spring modes are Reverse and Modulated 'verbs plus the new Halo reverb, of which DigiTech claims that "cascading octaves interspersed in the reverb decays will cast a heavenly glow over your tone." The official blurb describes the seven modes as follows: "Room provides intimate warmth, while Hall offers a vast soundspace. Spring faithfully reproduces the 'sproing' and surf music 'splash' of classic guitar amp spring reverb, while Plate delivers the unmistakable cavernous sound of the large metal plate reverb units found in well-heeled professional recording studios. "Modulated mode adds a richly textured chorus effect while Reverse serves up backwards-tape effects for head-spinning sonic psychedelia. 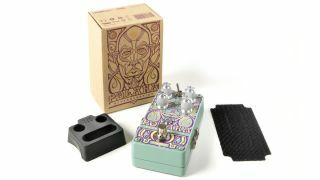 As if that wasn't enough, Polara introduces DigiTech's new Halo effect, with cascading octaves interspersed in the reverb decay for a spellbinding sonic aura." Alongside the Type control that allows you to switch between the pedal's seven voices, Level adjusts the wet/dry mix, Decay controls reverb duration and Liveliness tames or enhances the high-end response. In addition, the Reverb Tails on/off toggle allows you to select whether the effect cuts off sharply when you switch the pedal off or trails away naturally. The true bypass pedal features mono and stereo input and output jacks and even a knob guard to lock your settings in place and prevent accidental changes during the heat of battle. The Polara is available from November 2014, with a US SRP of $187.44. Visit DigiTech for more.